Welcome to JollyNotes.com! Thank you so much for stopping by! Mission, Vision And Purpose of JollyNotes.com ~ Inspiration for Joyful Living. 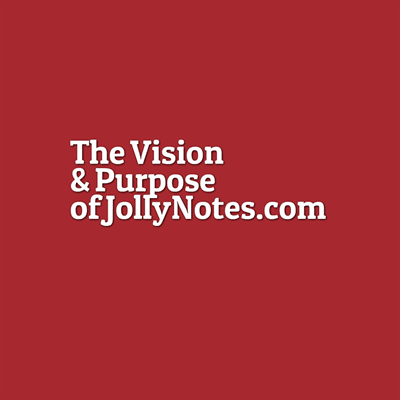 The mission of JollyNotes.com is to continually inspire people around the world to experience joyful and purposeful living – through inspirational, motivational, uplifting & encouraging notes (“Jolly Notes”), Bible verses, quotes, scriptures, words, music, videos, and more. 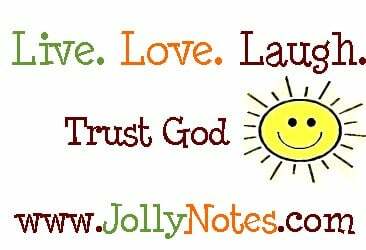 The vision and purpose of Jolly Notes is to continually encourage all who visit to live and experience joyful and purposeful lives: Getting to know God Better daily; and Becoming who God created you to be, By God’s grace and By God’s Mighty Power! Our prayerful hope is that this ministry will help inspire and encourage lives and hearts around the world to shine, radiate goodness and remain joyful as we all inevitably go through the ups, downs and in-betweens of life. We pray the content posted on this website will continually make you smile, laugh, explore, reflect on or be reminded about different issues. We pray the articles posted will inspire you, encourage you, challenge you positively, and always be a blessing to you. We pray that lives will always be positively shaped. We pray that we will never stop learning from our experiences as well as the experiences of others; and that our sound, solid characters will be built in the process. We pray that we will all continually gain Wisdom and experience Joy – Joy that isn’t necessarily dependent on our circumstances; Joy that brings strength; Joy that brings peace; Joy that fills our hearts with goodness and love. Our prayer for you today is that you will “go out with joy, be led forth in peace, and always count on God” (Isaiah 55:2). May all our lives forever be testimonies of God’s grace and God’s goodness, as we grow in our daily walk with God. Amen. Explore & Enjoy: Daily Bible Verse Blog; Joyful Living Blog; Short Christian Podcasts (Jolly Pods); List of Parables in the Bible; Christian Jokes; Christian Fridge Magnets; Favorite Bible Verses; Getting to know God; & Get Daily Bible Verses Sent to Your Email. See Also: Bible Verses about Learning & Growing, How to live a Joyful Life, Inspirational Stories, Encouraging Videos, Inspirational Songs, Inspirational Hymns, Prayers of Blessing in the Bible; & Happy Words. May God bless you with Joy, Peace & His Presence; May His face continually shine upon you!